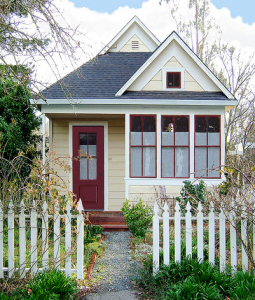 Small houses can be affordable, cozy and charming, but they can also seem way too small when you pack in your family and all of your stuff. This doesn’t mean that you have to splurge on a bigger house, however. By following a few easy tips, you can get the most out of your small house. Even large houses can quickly get overwhelmed with clutter, but small homes can be devoured by clutter much more quickly. Therefore, it is important to get rid of anything that you don’t want or need. Now is not the time to be a pack rat: Go through your stuff, and donate or throw away unnecessary items that are just taking up space. Along with initially cleaning out all of your cabinets, closets, shelves and the rest of your home, make sure to keep up with your de-cluttering throughout the year. For instance, make sure to throw away or recycle junk mail, catalogs, magazines and other items as they come in. If you don’t, they could quickly pile up and take over your small home. A well-organized home is not only more comfortable and more appealing, but it also provides you with more space; this is an essential when you are trying to get the most out of your small house. Use storage units, containers, boxes, baskets and other organizational items to make sure that everything in your home has a specific place. Make an effort to put things in the proper places at all times; this will eventually become a habit, and it will make your small home seem much more spacious. Many people who have small houses do not realize that they can branch outside in order to make more space. For instance, you can turn your garage into an additional living space, and you can build a storage shed outdoors for storing items that seem to be taking over the inside of your home. According to Extra Storage Space – Palmdale another great option is to rent a storage space for things you don’t use all the time. After you have maximized your space and organized your home, you should put in an effort to make your small home comfortable and appealing for your family. Simple things, such as painting the walls or hanging up a few pictures, can make your home feel cozy, and you aren’t as likely to notice how small or cramped your space is if you feel comfortable in it. Lyndsi is a blogger and organization expert, and is currently researching Denver CO storage. In her free time she enjoys mountain climbing with her friends.